Fans of “metal” shows expect a certain amount of head banging, moshing and flashing of the “sign of the horns” during a concert. Monday night’s scene at El Corazon didn’t disappoint. From the first note of the first song by the first of five bands, that energy never stopped. 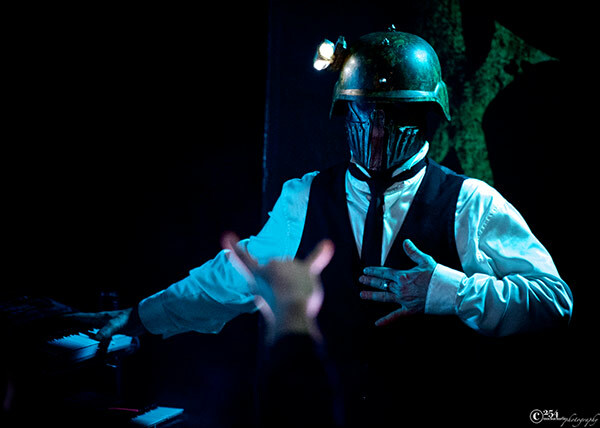 The line-up included headliner Mushroomhead, with opening support from Doyle, and The Family Ruin. Two local bands, Kill Closet and Sanction VIII, rounded out the bill. Although Mushroomhead (MH) was a part of last year’s Mayhem Festival, they haven’t headlined a show in Seattle since 2011. The band (for the most part) has been together since 1993, and the fact that they have upwards of nine members on stage throughout the entire show, their choreographed movements were a sight to behold. Two of their drummers played water drums at the front of the stage, tossing their sticks, and banging in unison, interacting with fans and captivating the crowd as they played. Each player has created their own “persona” with their use of masks and costumes. Members of the band migrated from other bands, and when they came together as MH, they used masks to create a new identity (to differentiate themselves apart from their other bands). The idea stuck, and fans now look forward to the unveiling of newer masks from time to time, as the band alters them slightly for different tours. Fans can even view and bid on masks on a Facebook page that they’ve dedicated to showcasing originals, prototypes, and reproduction masks for sale to the general public (bidding for most masks start around $400 and go up until the band feels that a proper offer has been made). This tour is bittersweet for frontman Jeffrey Nothing (Jeffrey Hatrix). His wife was recently diagnosed with stage three colon cancer, and Nothing will miss some of the shows so he can be home with her. As a founding member, this marks Nothing’s first time away from the band. Friends have set up a GoFundMe account on Nothing’s behalf to raise funds to help reduce any financial burden. Because the band has three vocal performers, in Nothing’s absence they will continue on this current tour, which ends mid-May. The Wacken Open Air Festival this August is the band’s only announced international gig, when they will perform along with over 100 other bands. Already sold out, this is the tenth year in a row that Wacken, the largest heavy metal festival in the world, has sold out months in advance.